Best of all. It's a Beer Meister. Over 45 years in the beer dispenser industry! PRO SERIES DUAL GAUGE REGULATOR: Easily measure PSI and Co2 volume and adjust Co2 output pressure using this Kegco 542 Pro Series Double Gauge Regulator packed with premium features. The top gauge indicates output pressure, while the side gauge tells you what's left in the Co2 tank, so you don't run out of gas during a party. The Standard plated brass body has a large pressure adjustment knob for easy use and includes a manual pressure release valve. LEVER HANDLE KEG COUPLER: This NSF-approved Kegco KT85D-L D System Keg Coupler features a sturdy nickel-plated forged brass body with a stainless steel probe, and is designed for use with all domestic brand American D system Sankey kegs. The lever-handle design is easy to use - simply pull out and then down on the handle to couple the keg. A 55-psi pressure relief valve makes this coupler even more convenient to use, allowing over-pressurized gas to escape before it enters your keg. 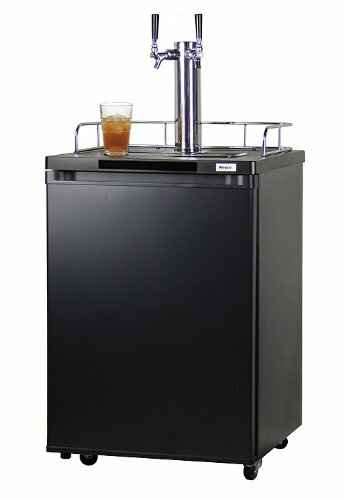 SINGLE FAUCET DRAFT BEER TOWER: Featuring a beautiful Standard-plated metal finish and a matching Standard-plated faucet with metal lever, this 3" diameter air-cooled Kegco D4743T draft beer tower is the same stylish tower used on most commercial grade kegerators. This tower conveniently includes 5 feet of clear beer tubing ending in a nozzle and hex nut assembly for quick connection to all standard keg couplers, as well as a gasket and for screws for easy mounting. 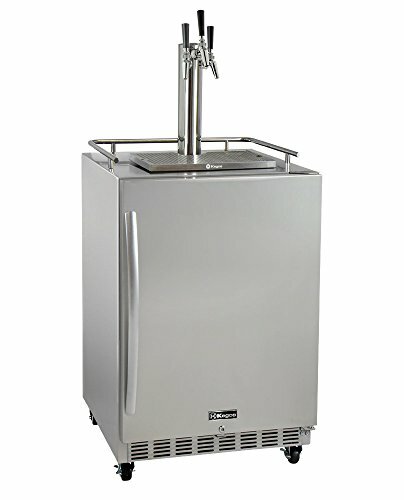 ADA COMPLIANT: The low 32" height is compatible with ADA requirements to make your favorite beverages more accessible. A front-venting design allows you to build this kegerator into cabinetry for a seamless look that is easy to maintain and provides more floor space. The fully finished cabinet also makes this keg cooler a beautiful freestanding addition to nearly any room in your home. 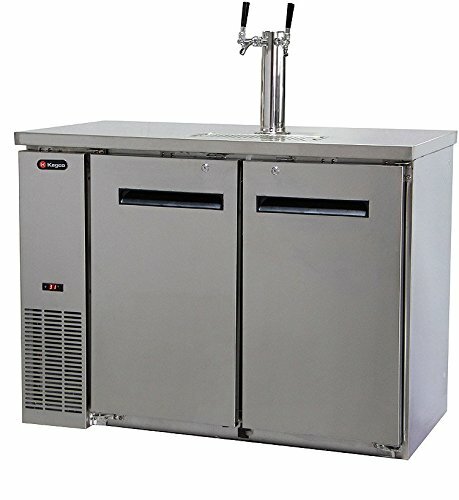 INCLUDES COMPLETE KEG TAPPING KIT: The HK48BSA-2 comes complete with a dual tap draft dispense system and everything you need to tap two domestic D system kegs, including a dual faucet stainless draft tower, two stainless steel faucets, an empty 5 lb. 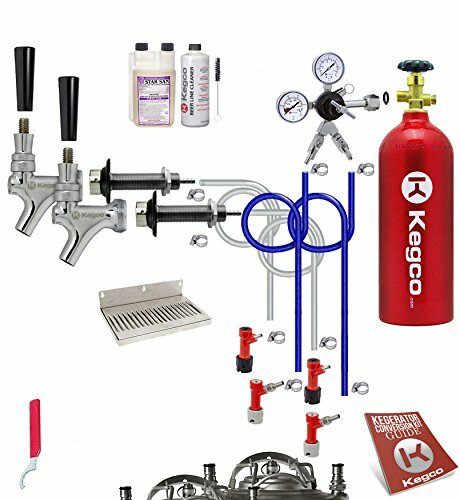 CO2 tank, a double gauge regulator, two low profile D system keg couplers, a 12" x 7" stainless steel drip tray, and a beer line cleaning kit. 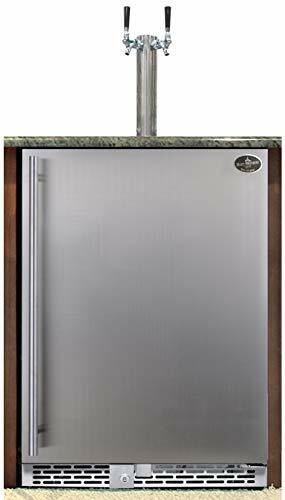 MARVEL KEGERATOR: Suitable for built-in or freestanding applications and designed for indoor use only, this Marvel Kegerator features enhanced microprocessor technology, an ultra-efficient compressor, and an integrated drain system. 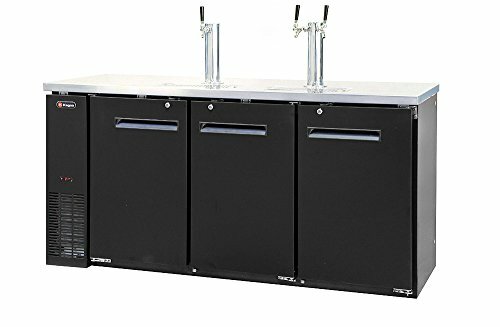 It has a fully-finished black cabinet with an overlay door that accepts a custom wood panel, and comes complete with Beverage Factory's X-CLUSIVE Premium 1-Faucet Homebrew Keg Tap Kit and everything needed to dispense one ball lock keg of homebrew beer. DELUXE HAND PUMP PRESSURIZED CLEANING KIT WITH 32 OZ. CLEANER: With this kit, you no longer need to remove the faucets to clean your dispense system. Simply unscrew the fitting on the draft beer line from the keg coupler and screw it onto the cleaning kit. This kit includes a high pressure hand pump cleaning bottle, a 32 oz. bottle of beer line cleaner, and a nylon faucet brush. The cleaning solution can be used for approximately 32 cleanings. 100% STAINLESS STEEL CONTACT SINGLE FAUCET DRAFT BEER TOWER: This tower uses stainless steel components for better tasting beer. 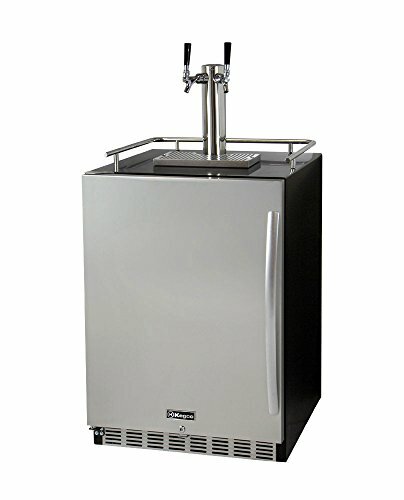 The fittings, shank, and faucet are all made from stainless steel, so your beer will only come into contact with durable and sanitary stainless steel all the way from the keg to your glass. One black ABS plastic faucet knob, mounting screws, and a mounting gasket are also included with this tower. PRO SERIES DOUBLE GAUGE CO2 REGULATOR: This Pro Series dual gauge CO2 regulator works with any CO2 cylinder with a CGA-320 valve and measures both PSI and the volume of the CO2 gas in the cylinder. It also features a pressure release valve and a large hand control that makes it easy to adjust the pressure inside of the keg without requiring a screwdriver. ETL and NSF Certified; R290 Refrigerant - Environmentally Friendly and Energy Efficient! PRO SERIES DUAL GAUGE REGULATOR: This Kegco 542-2 Pro Series Two Product Dual Gauge Regulator has a y-splitter and two independent shut-off valves that let you dispense two kegs at the same pressure! It features a chrome plate brass body, two gauges to display PSI and Co2 volume, and a large, easy-to-use pressure adjustment knob. Also included are a manual pressure release valve and an integral tamper-proof safety relief valve that releases at 45-psi. DUAL FAUCET DRAFT BEER TOWER: This 3" diameter air-cooled chrome-plated metal draft beer tower comes complete with two NSF-approved chrome-plated metal faucets with brass levers and two black ABS plastic faucet knobs. Two 5' lengths of 3/16" I.D. beer line extend from the bottom of the tower. These thermoplastic vinyl beer hoses remain flexible and durable at recommended temperatures and pressures, are unaffected by normal cleaning compounds, and will not rot, swell, or dry out. BUILT-IN OR FREESTANDING USE: Features a front-venting design that allows you to build this triple faucet commercial left hinge kegerator into cabinetry for a seamless look that is easy to maintain and provides more floor space. A stainless steel guard rail and casters are provided for applications where mobility is more beneficial. The attractive stainless steel door includes a lock to keep the contents secure, and both a towel bar and a curved handle are included for easy customization. 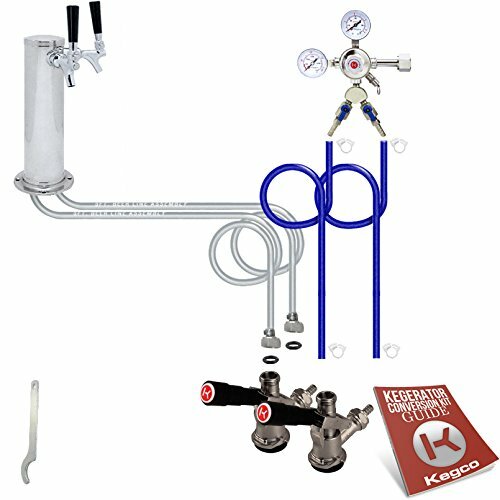 INCLUDES EXCLUSIVE 3-TAP COMMERCIAL DIRECT DRAW KIT: Kegco's X-CLUSIVE Commercial Direct Draw Kit comes complete with an empty 5 lb. aluminum CO2 tank with electric red epoxy finish, a Kegco YH-762 commercial-grade double gauge CO2 regulator, three ergonomic Kegco KTS97D-W "D" system lever handle keg couplers, a 3" diameter polished stainless steel draft tower with three stainless Perlick 630SS faucets for 100% stainless contact, and a 16" x 10" stainless steel drip tray. Note: Beverage Factory is the only Authorized Reseller of Kegco Kegerator Kits. BUILT-IN OR FREESTANDING USE: Features a front-venting design that allows you to build this triple faucet left hingekegerator into cabinetry for a seamless look that is easy to maintain and provides more floor space. A stainless steel guard rail is included to prevent glasses or mugs from sliding off the top in freestanding applications. The attractive stainless steel door includes a lock to keep the contents secure, and both a towel bar and a curved handle are included for easy customization. INCLUDES EXCLUSIVE PREMIUM 3-TAP DIRECT DRAW KIT: Kegco's X-CLUSIVE Premium Direct Draw Kit comes complete with an empty 5 lb. aluminum CO2 tank with electric red epoxy finish, a Kegco LH-542 Pro Series double gauge CO2 regulator with air distributor, three Kegco KT85D-L "D" system lever handle keg couplers, a 3" diameter polished stainless steel draft tower with three stainless faucets for 100% stainless contact, a 12" x 7" stainless drip tray, and a deluxe hand pump cleaning kit. PRO SERIES DUAL GAUGE REGULATOR: Easily measure PSI and Co2 volume and adjust Co2 output pressure using this Kegco 542 Pro Series Double Gauge Regulator packed with premium features! The top gauge indicates output pressure, while the side gauge tells you what's left in the Co2 tank, so you don't run out of gas during a party. The chrome plated brass body has a large pressure adjustment knob for easy use and includes a manual pressure release valve. 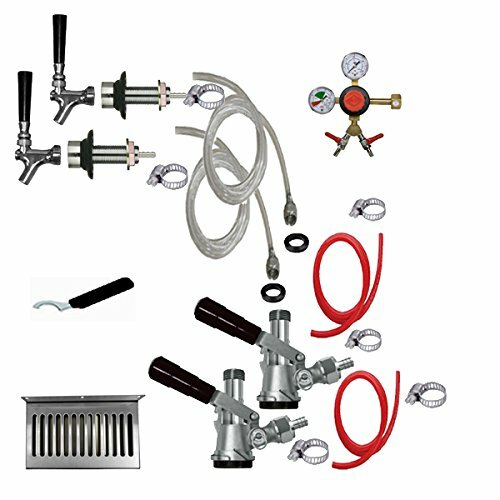 BALL LOCK KEG COUPLERS: This complete ball lock home brew keg tap set includes both a gas in and beer out coupler for easy tapping of ball lock Cornelius Pepsi kegs. 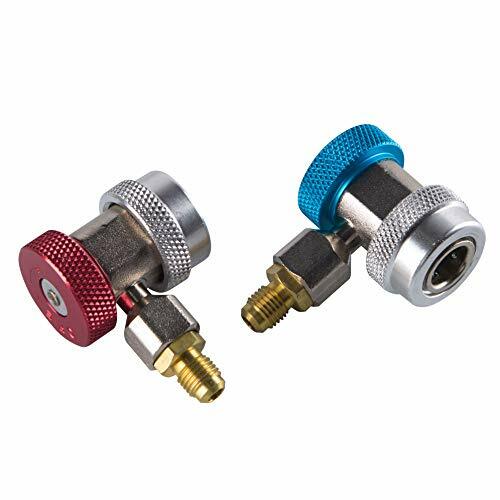 The gas in comes with a 1/4" nut and 5/16" hose barb already attached, allowing you to quickly connect it to the same size air line that standard draft beer regulators use. The beer out connector has a 3/16" hose barb that connects to standard 3/16" beer line. CHROME BEER FAUCET WITH BRASS LEVER: Featuring a forged brass body and highly polished chrome finish, this NSF-approved beer faucet puts a stylish finishing touch on your kegerator at a price you'll love. The brass shaft assembly and lever includes a non-stick ball washer for smooth operation, and the lever has standard threading that is compatible with most branded tap handles. INCLUDES EMPTY 5 LB. ALUMINUM CO2 TANK: All of our brand new tanks are made from high strength aluminum alloy which is not as heavy as a steel tank and will not rust. These eye-catching tanks have a glossy red coating that acts as an extra layer of protection against corrosion and wear. BUILT-IN OR FREESTANDING USE: Features a front-venting design that allows you to build this dual faucet left hinge kegerator into cabinetry for a seamless look that is easy to maintain and provides more floor space. A stainless steel guard rail is included to prevent glasses or mugs from sliding off the top in freestanding applications. The attractive stainless steel door includes a lock to keep the contents secure, and both a towel bar and a curved handle are included for easy customization. INCLUDES EXCLUSIVE PREMIUM 2-TAP DIRECT DRAW KIT: Kegco's X-CLUSIVE Premium Direct Draw Kit comes complete with an empty 5 lb. aluminum CO2 tank with electric red epoxy finish, a Kegco LH-542-2 Pro Series two product double gauge CO2 regulator, two Kegco KT85D-L "D" system lever handle keg couplers, a 3" diameter polished stainless steel draft tower with two stainless faucets for 100% stainless contact, a 12" x 7" stainless drip tray, and a deluxe hand pump cleaning kit. 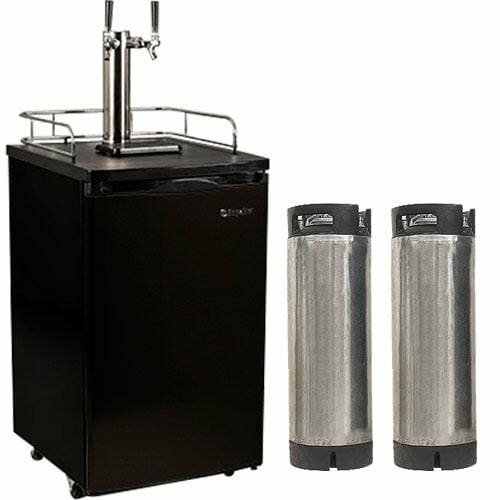 INCLUDES COMPLETE KEG TAPPING KIT: This keg beer dispenser provides you with all of the equipment you'll need to pour a cold, refreshing glass of beer straight from the keg, including a brand new 5 lb. aluminum CO2 tank, a single gauge CO2 regulator, 5 feet of 5/16 inch I.D. blue air line assembly with 2 snap clamps, D system keg couplers, and a 3" diameter chrome plated metal two faucet draft tower. The CO2 tank ships empty and will need to be filled locally. LARGE INTERIOR: The interior of this keg beer refrigerator is spacious enough to easily hold any full-size keg, including Coors kegs, Miller kegs, and rubber kegs. It can also hold up to two 5 gallon D system kegs or up to three 5 gallon Cornelius ball lock home-brew kegs, allowing you to dispense more than one type of beer at a time. 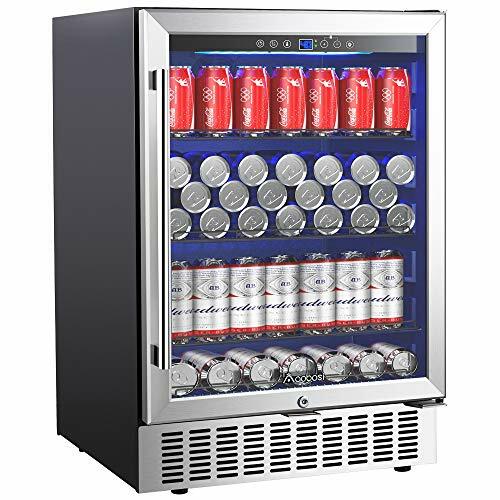 When you're not using it as a beer dispenser, it can easily be converted into an all-refrigerator using the two included adjustable storage shelves. CONVENIENT DESIGN FEATURES: This Kegco kegerator's convenient design boasts great features like attractive styling, a removable and easy-to-clean built-in drip tray, a chrome guard rail that helps prevent your mugs and glasses from sliding off of the countertop, and easy rolling casters that allow you to easily move the unit from one location to another. The casters lock once the unit is in position, so it won't roll away again until you want it to. POWERFUL COOLING TECHNOLOGY: A digital temperature display with push button controls makes it easier than ever to set and verify the internal temperature of your keg refrigerator. Fan-forced cooling gives this unit one of the coldest temperature ranges of any beer cooler on the market today, allowing it to be set as low as 32 degrees to dispense ice cold beer. A Deep Chill function gives you to ability to quickly cool down a warm beer keg by forcing the compressor to work continuously. INCLUDES EXCLUSIVE 2-TAP COMMERCIAL DIRECT DRAW KIT: Kegco's X-CLUSIVE Two Tap Commercial Direct Draw Kit comes complete with an empty 5 lb. 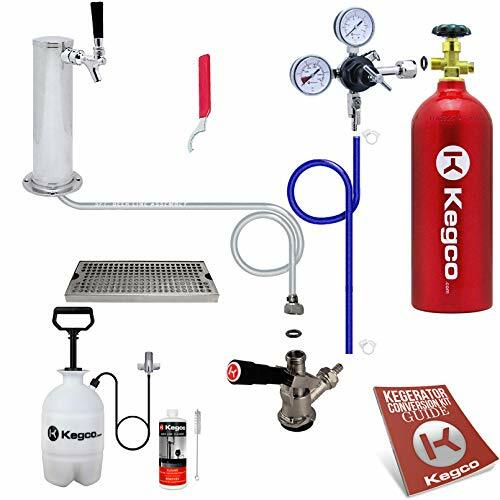 aluminum CO2 tank with electric red epoxy finish, a two product Kegco YH-762-2 commercial-grade double gauge CO2 regulator, two ergonomic Kegco KTS97D-W "D" system lever handle keg couplers, a 3" diameter polished stainless steel draft tower with two stainless Perlick 630SS faucets for 100% stainless contact, and a 16" x 10" stainless steel drip tray. BUILT-IN OR FREESTANDING USE: Features a front-venting design that allows you to build this triple faucet commercial kegerator into cabinetry for a seamless look that is easy to maintain and provides more floor space. A stainless steel guard rail and casters are provided for applications where mobility is more beneficial. The attractive stainless steel door includes a lock to keep the contents secure, and both a towel bar and a curved handle are included for easy customization. 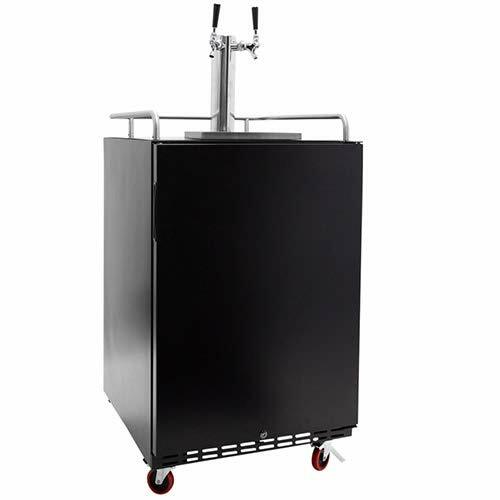 INCLUDES COMPLETE KEG TAPPING KIT: Equipped with a complete direct draw kit for two D system domestic kegs, this beer keg cooler comes with everything you need to dispense beer from two kegs at the same time. The dispense kit includes a brand new 5 lb. 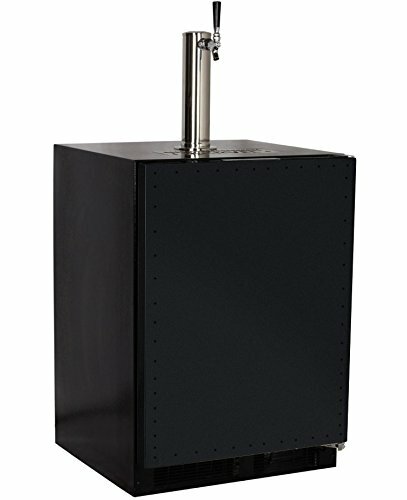 aluminum CO2 tank, a single gauge CO2 regulator with air distributor, two D system lever handle keg couplers that can tap all domestic kegs, a 3" diameter chrome plated metal draft tower, and two chrome beer faucets with brass levers. LARGE INTERIOR: This keg cooler has a spacious interior that will hold one full size, straight pony, or quarter slim keg, and up to two sixth slim, strap handle, or rubber home brew kegs (it will not fit bevel or rubber kegs that are wider in the middle than at the top or bottom). Two removable wire shelves are included, allowing you to easily convert this beer refrigerator into an all-refrigerator or beverage center when you're not using it to dispense kegs of beer. 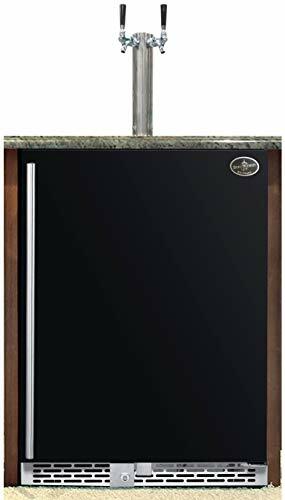 SLEEK AND STYLISH DESIGN: 2-1/2" casters allow you to move this stylish kegerator to any room in your home, and it's sleek black cabinet with stainless steel door is sure to look great with any decor. The textured serving counter top features a removable drip tray that collects spills for easy clean-up and an attractive metal safety rail that helps prevents your beer mugs and glasses from sliding off. 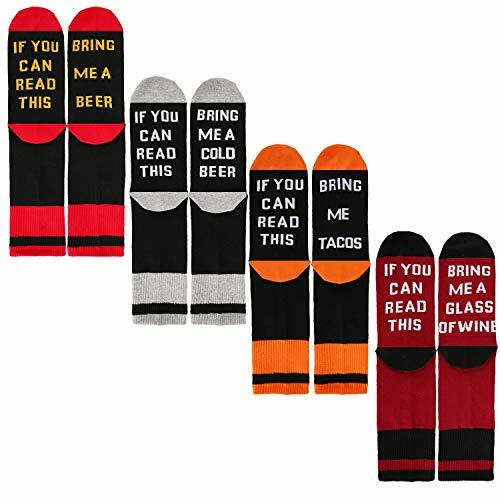 Sit back, relax, and enjoy serving your favorite draft beer with style and ease! 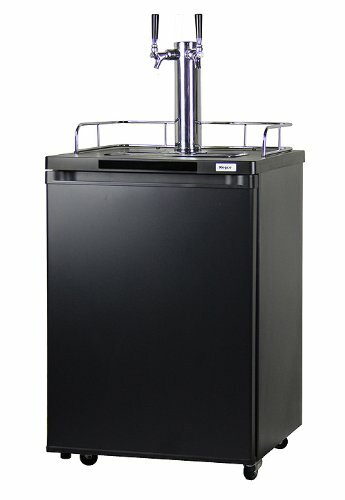 POWERFUL AND ENERGY EFFICIENT COOLING TECHNOLOGY: Perfect for in-home keg storage, this draft beer dispenser has been specially designed for ultra-quiet performance and features a 25% more energy efficient design that delivers powerful cooling while saving you money each month. The internal temperature can be adjusted between 34 and 45 degrees Fahrenheit to store and dispense your beers at their ideal temperatures. It is adjusted using a conveniently located manual dial. BUILT-IN OR FREESTANDING USE: Features a front-venting design that can be built in undercounter to provide a seamless look for your backyard BBQ island or outdoor kitchen. A stainless steel guard rail is included to prevent glasses or mugs from sliding off the top in freestanding applications. The attractive stainless steel door includes a lock to keep the contents secure, and both a towel bar and a curved handle are included for easy customization. INCLUDES EXCLUSIVE 3-TAP PREMIUM DIRECT DRAW KIT: Kegco's X-CLUSIVE Three-Tap Premium Direct Draw Kit comes complete with an empty 5 lb. 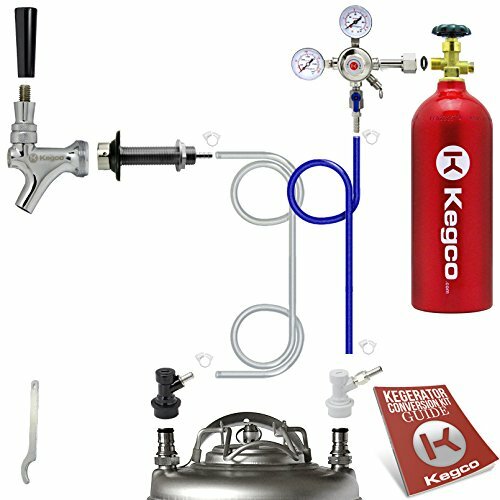 aluminum CO2 tank with electric red epoxy finish, a LH-542 Pro Series double gauge CO2 regulator, three Kegco KT85D-L "D" system lever handle keg couplers, a 3" diameter polished stainless steel draft tower with three stainless faucets for 100% stainless contact, a 12" x 7" stainless drip tray, and a deluxe hand pump cleaning kit. INCLUDES COMPLETE KEG TAPPING KIT: This high-performance kombucha keg dispenser comes complete with everything you'll need to dispense up to two kegs of kombucha at a time, including a brand new 5 lb. aluminum CO2 tank, a single gauge CO2 regulator with a 2-way air distributor, two 5 foot lengths of 5/16 inch I.D. air line assembly with snap clamps, two sets of ball lock home brew keg couplers, and a 3" diameter double faucet stainless steel tower. The CO2 cylinder ships empty. 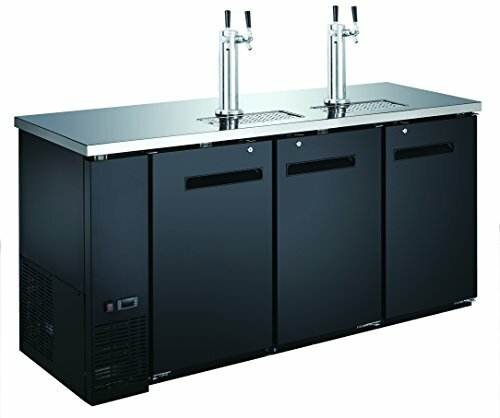 100% STAINLESS STEEL CONTACT: This kombucharator has been specially designed for the unique requirements of dispensing kombucha, and comes with a direct draw system with all stainless steel contact to provide a sanitary environment for the live cultures found in kombucha. 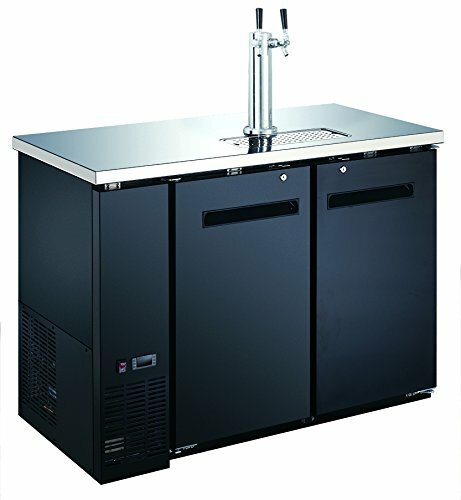 This dispense system features food grade plastic beer lines and a stainless steel draft tower with stainless steel faucets and fittings for a clean and sanitary journey from the keg to your glass. LARGE INTERIOR: This keg cooler features a large interior that can accommodate up to three 5 gallon Cornelius ball lock home-brew kegs, giving you the ability to dispense from two kegs while keeping another keg cooled and ready. 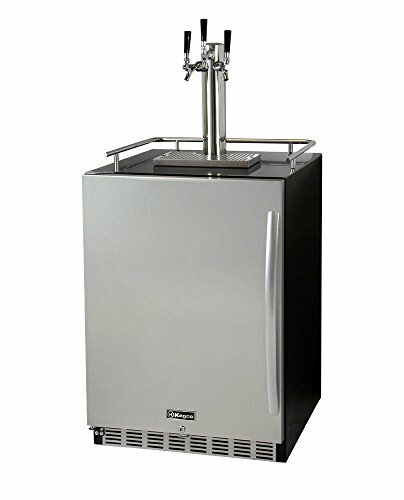 When you aren't using this kombucha keg refrigerator to dispense kegs, it can be easily converted into a regular all-refrigerator or beverage center using two included storage shelves to provide additional refrigerated storage space for food and other beverages. POWERFUL AND ENERGY EFFICIENT COOLING TECHNOLOGY: This kombucha dispenser has a quiet and 25% more energy efficient design that makes it perfect for residential use, delivering superior keg cooling while helping to save you money each month on your electric bill. Using a manual dial that is easily accessible from the back of the kombucharator, you can adjust the temperature between 34 degrees Fahrenheit and 45 degrees Fahrenheit to store your kegs at their ideal temperature. 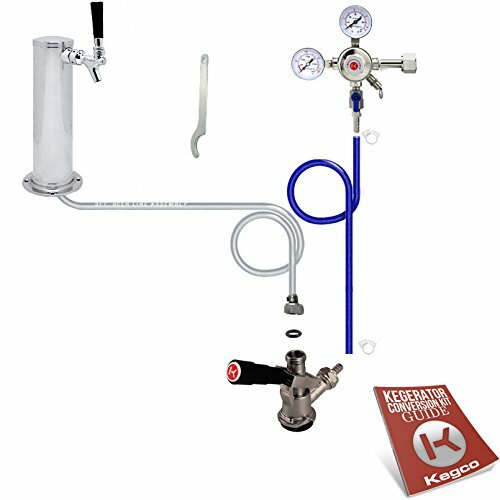 INCLUDES COMPLETE KEG TAPPING KIT: With this Kegco beer keg dispenser, you get everything you need to begin dispensing delicious draft beer straight from a keg. The two tap dispense system includes a brand new 5 lb. aluminum CO2 tank, a single gauge CO2 regulator with air distributor, two D system lever handle keg couplers that can tap all domestic kegs, a 3" diameter dual faucet chrome plated metal draft tower, and two chrome beer faucets with brass levers. The CO2 tank ships empty. LARGE INTERIOR: This keg cooler has a spacious interior that can accommodate one full size, straight pony, or quarter slim keg, and up to two sixth slim, strap handle, or rubber home-brew kegs (it will not hold bevel or rubber kegs, commonly used by Miller and Coors). If you need additional cold storage when not dispensing kegs, two removable wire shelves are included to allow you to easily convert this keg refrigerator into an all-refrigerator or beverage center. SLEEK AND STYLISH DESIGN: Your kegs are housed in a sleek black cabinet with a decorative black door, which is sure to look great in any room of your home. This unit also features a textured serving countertop with an attractive metal safety rail that keeps your glasses and beer mugs from sliding off, as well as an easy-to-clean removable drip tray that collects spills to make clean-up a breeze. 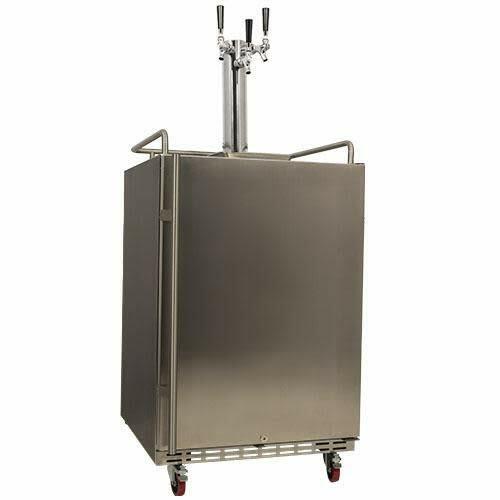 The 2-1/2" locking casters allow you to easily move this keg dispenser anywhere you need it. 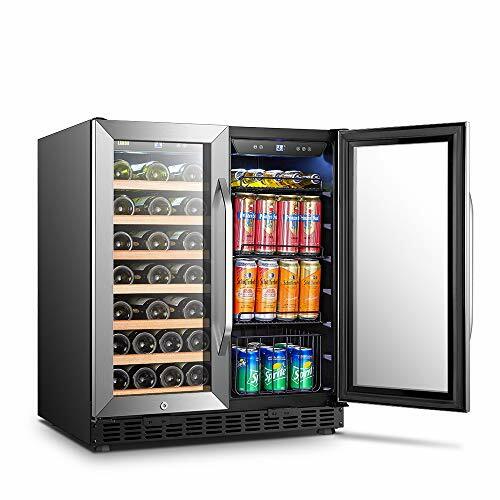 POWERFUL AND ENERGY EFFICIENT COOLING TECHNOLOGY: This beer cooler was designed for ultra-quiet performance, and features a 25% more energy efficient design that saves you money each month on your electricity bill while delivering powerful cooling. A temperature control dial conveniently located inside of the cabinet allows you to adjust the internal temperature between 34 and 45 degrees Fahrenheit, so you can store and dispense your beers at their ideal temperatures. 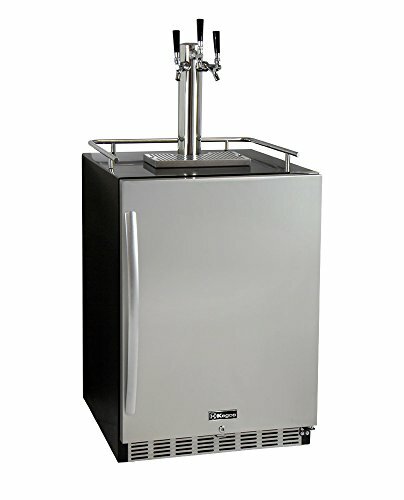 INCLUDES PREMIUM KEG TAPPING KIT: With this Kegco premium kegerator, you get everything you need to begin dispensing delicious draft beer straight from a keg. The two tap dispense system includes a brand new 5 lb. aluminum CO2 tank, a two product Kegco 542-2 Pro Series double gauge CO2 regulator, two 5 foot lengths of 5/16" I.D. draft beer line assembly with snap clamps, two Kegco KT85D-L D system lever handle keg couplers that can tap all domestic taps, and a 3" diameter draft tower. 100% STAINLESS STEEL CONTACT: The premium direct draw kit that is included with this unit features 100% stainless steel contact, ensuring that your beer will only touch sanitary stainless steel components from the keg to your glass! The probe on the keg couplers, the tower shanks, the faucets, and all of the fittings are stainless steel. This premium kit also comes with a deluxe hand pump pressurized cleaning kit that makes it easy to keep your dispense system squeaky clean between kegs. LARGE INTERIOR: This keg cooler's spacious interior can accommodate one full size, straight pony, or quarter slim keg, and up to two sixth slim, strap handle, or rubber handle home-brew kegs (it cannot hold bevel or rubber kegs, commonly used by Miller and Coors). Two removable wire shelves are included that allow you to easily convert this keg refrigerator into an all-refrigerator or beverage center for additional cold storage when you're not dispensing kegs. 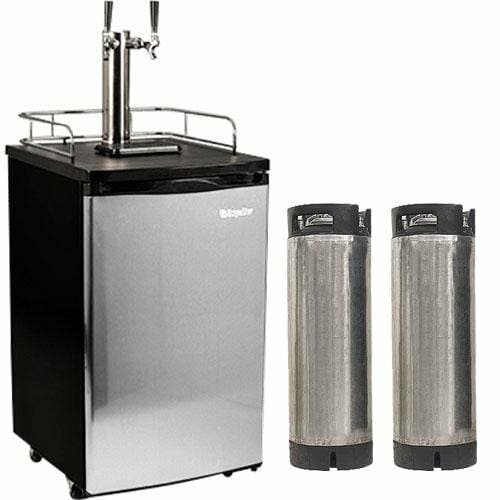 INCLUDES COMPLETE KEG TAPPING KIT: This two faucet keg beer dispenser comes complete with a two tap direct draw system with everything you need to pour a tasty glass of cold draft beer straight from the keg, including a brand new 5 lb. aluminum CO2 tank, a single gauge CO2 regulator with glossy red coating, 5 feet of 5/16 inch I.D. 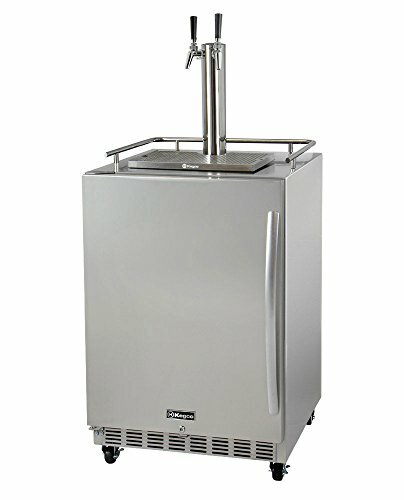 blue air line assembly with 2 snap clamps, D system keg couplers that can tap domestic kegs, and a 3" diameter chrome plated metal two faucet draft tower. LARGE INTERIOR: This keg dispenser can fit one full size, pony, or quarter slim keg, two 5 gallon commercial kegs along with one 5 gallon homebrew keg, or up to three 5 gallon homebrew kegs. 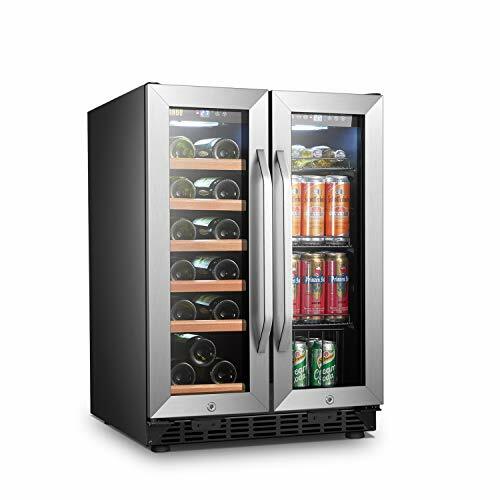 When you aren't using it to store and dispense kegs, the keg refrigerator can be converted into a regular all-refrigerator or beverage center using the two included adjustable storage shelves, providing additional refrigerated storage space for food and other beverages. 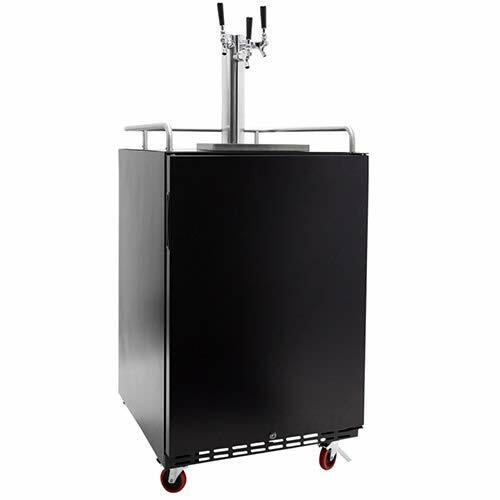 SLEEK AND STYLISH DESIGN: The sleek matte black finish on this Kegco keg cooler compliments any decor, and will not show fingerprints like a shiny finish might. To cut down your cleaning time, the convenient design features an easy-to-clean removable drip tray, which can be easily taken out and cleaned in the dishwasher, and an attractive chrome safety rail, which helps keep glasses from sliding off. Easy roll casters make it easy to move the unit to any room in your house. 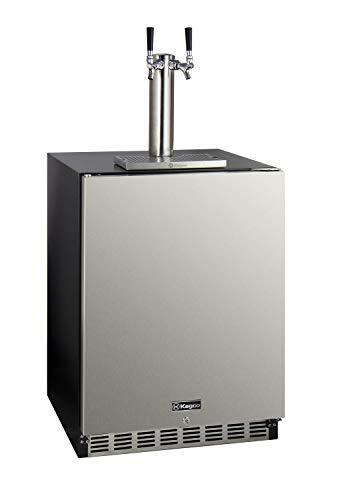 POWERFUL AND ENERGY EFFICIENT COOLING TECHNOLOGY: Specially designed for in-home use, this ultra-quiet draft beer dispenser features a 25% more energy efficient design that delivers powerful cooling while saving you money each month on your utility bill. Thermostatic temperature control keeps the temperature in the range of 35 to 42 degrees Fahrenheit, and can be easily adjusted using the adjustable mechanical temperature control conveniently accessible at the back of the unit. BUILT-IN OR FREESTANDING USE: Features a front-venting design that allows you to build this dual faucet kegerator into cabinetry for a seamless look that is easy to maintain and provides more floor space. A stainless steel guard rail is included to prevent glasses or mugs from sliding off the top in freestanding applications. The attractive stainless steel door includes a lock to keep the contents secure, and both a towel bar and a curved handle are included for easy customization. 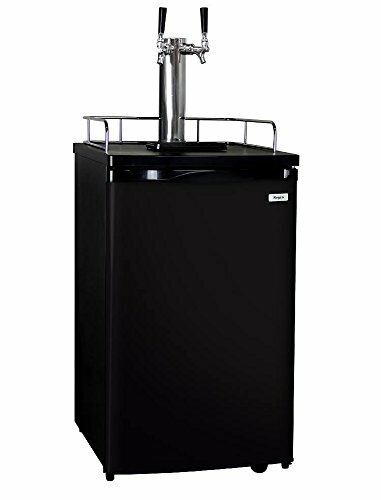 DIRECT DRAW KIT NOT INCLUDED: This kegerator comes with an air-cooled two-faucet Kegco draft beer tower. It DOES NOT come with a direct draw kit. If you do not already own the necessary draft dispense components, you will need to purchase them before you will be able to dispense kegs using this kegerator. You will need a CO2 cylinder, a CO2 regulator, keg couplers that are compatible with the types of kegs that you will be dispensing, air line, and clamps. DIGITAL TEMPERATURE DISPLAY: A clear digital display conveniently located on the front of the unit allows you to easily view the unit's internal temperature without opening a door. The temperature can be adjusted between 31 degrees Fahrenheit and 41 degrees Fahrenheit using a manual dial inside of the cabinet, letting you store and dispense your kegs at their ideal temperature. Beer is best dispensed between 32 degrees Fahrenheit and 38 degrees Fahrenheit. LARGE INTERIOR: The two-door beer keg cooler has a spacious enough interior to accommodate many different keg storage configurations, including two full size or pony kegs, up to three quarter slim kegs, and up to seven 5 gallon kegs. 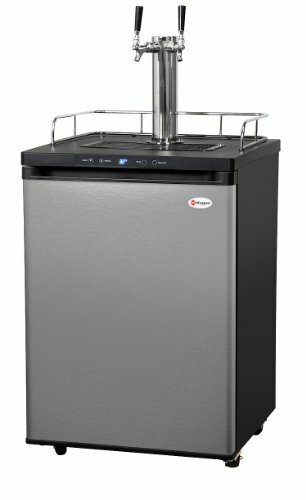 This versatile kegerator even comes complete with two heavy-duty adjustable shelves that give you the ability to store cans and bottles or keep mugs frosty cold on one side while dispensing multiple 5 gallon kegs from the other side. 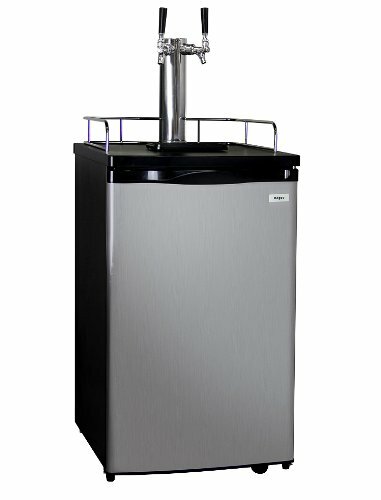 POWERFUL COOLING TECHNOLOGY: This keg dispenser features fan-forced cooling that keeps the beer in your kegs ice cold and hoses that direct cold air into each beer tower to ensure that the lines are cooled all the way up to the faucets. The refrigeration system utilizes ozone-friendly R134a refrigerant and can be easily accessed from the front of the unit, allowing you to use it in both built-in and freestanding applications. Kegco has designed this unit to be 25% more energy efficient. 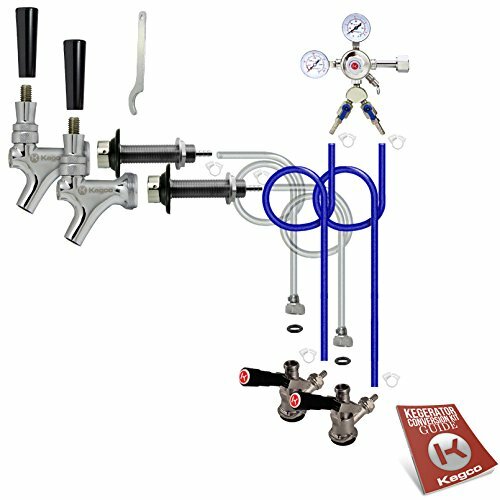 INCLUDES COMPLETE KEG TAPPING KIT: All of the necessary equipment from ball lock keg couplers down to washers and fittings has been included with this homebrew kegerator - all you'll need to do is provide the kegs of beer! Additionally, we've upgraded some of the items in this kit to their premium quality versions at no additional cost to you, like the corrosion-resistant CO2 tank, premium dual gauge regulator, and stainless steel draft beer tower. This adds a value of $35 to your unit! LARGE INTERIOR: Store and dispense up to three ball lock Pepsi kegs at a time in this keg cooler's spacious interior. When you aren't using it to dispense delicious home-brew, it can be easily converted into an all-refrigerator to provide additional refrigerated storage space for parties and special events. Each unit includes two adjustable shelves that can be spaced far enough apart to hold gallon jugs or 2-liter bottles. 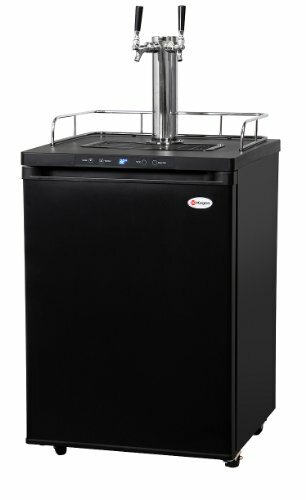 SLEEK AND STYLISH DESIGN: The black cabinet of this kegerator is fitted with a stainless steel door that is not only stylish but highly durable. Continued maintenance is easy thanks to a removable dishwasher safe plastic drip tray on top that collects drips and spills for fast clean-up. A chrome guard rail helps prevent glasses from being knocked off. Four locking casters allow you to move the unit from place to place for game day, poker night, holidays, and everyday use. POWERFUL AND ENERGY EFFICIENT COOLING TECHNOLOGY: A 25% more energy efficient design delivers powerful cooling while minimizing your impact on the environment - and your wallet! To help ensure that your beer is being dispensed at its ideal temperature, thermostatic temperature control keeps the internal temperature in the range of 35 degrees Fahrenheit to 42 degrees Fahrenheit. To adjust the temperature, you can easily access the mechanical temperature control at the back of the unit. 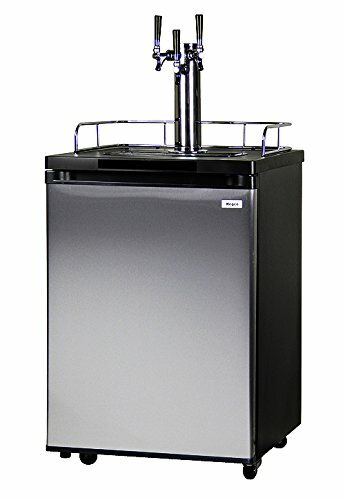 DIRECT DRAW KIT NOT INCLUDED: This kegerator comes with one single faucet draft beer tower and one dual faucet draft beer tower, but it DOES NOT include a direct draw kit. If you do not already own the necessary draft dispense components, you will need to purchase them before you can begin dispensing kegs using this kegerator. You will need a CO2 cylinder, a CO2 regulator, keg couplers that are compatible with the types of kegs that you will be dispensing, air line, and clamps. DIGITAL TEMPERATURE DISPLAY: The digital temperature display allows you to easily view the internal temperature without requiring you to open the door and disrupt cooling. The temperature can be adjusted between 31 degrees Fahrenheit and 41 degrees Fahrenheit using a manual dial conveniently located inside of the unit, allowing you to store and dispense your kegs at their ideal temperature. Beer is best dispensed between 32 degrees Fahrenheit and 38 degrees Fahrenheit. 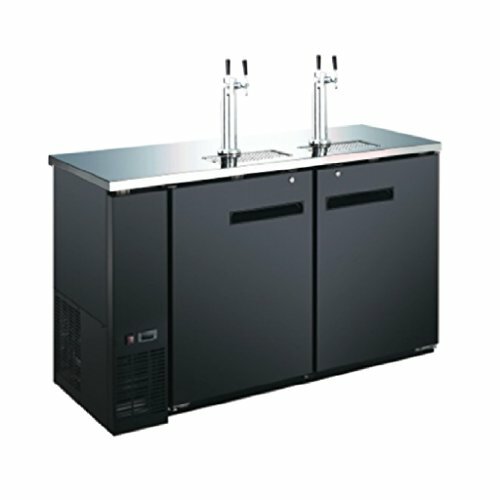 LARGE INTERIOR: This draft beer dispenser has a large enough interior capacity to accommodate three full size or pony kegs, up to six quarter slim kegs, and up to eleven 5 gallon kegs (with an externally mounted CO2 tank). The versatile beer keg refrigerator even comes with two heavy duty adjustable shelves, allowing you to store cans and bottles or keep your mugs frosty cold on one side while dispensing multiple 5 gallon kegs from the other side. POWERFUL COOLING TECHNOLOGY: Forced air refrigeration keeps the beer in your kegs ice cold, while hoses direct cold air into each beer tower to ensure that the line is cooled all the way up to the faucet. The refrigeration system uses ozone friendly R134a refrigerant and can be easily accessed at the front of the unit, making it suitable for both built-in and freestanding applications. This kegerator has a 25% more energy efficient design that will help save you money each month. BUILT-IN OR FREESTANDING USE: Features a front-venting design that allows you to build this triple faucet kegerator into cabinetry for a seamless look that is easy to maintain and provides more floor space. A stainless steel guard rail is included to prevent glasses or mugs from sliding off the top in freestanding applications. The attractive stainless steel door includes a lock to keep the contents secure, and both a towel bar and a curved handle are included for easy customization. INCLUDES EXCLUSIVE 2-TAP PREMIUM DIRECT DRAW KIT: Kegco's X-CLUSIVE Two-Tap Premium Direct Draw Kit comes complete with an empty 5 lb. 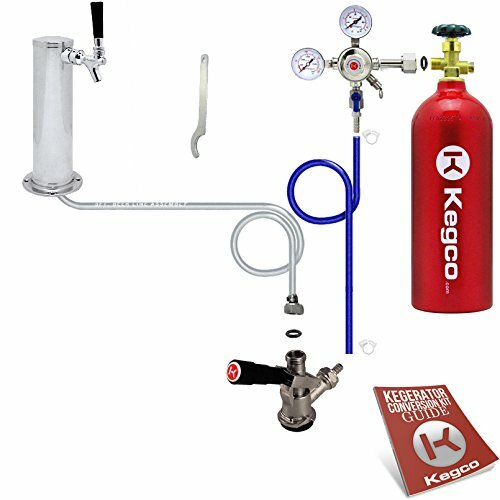 aluminum CO2 tank with electric red epoxy finish, a two product Kegco LH-542-2 Pro Series double gauge CO2 regulator, two Kegco KT85D-L "D" system lever handle keg couplers, a 3" diameter polished stainless steel draft tower with two stainless faucets for 100% stainless contact, a 12" x 7" stainless drip tray, and a deluxe hand pump cleaning kit. 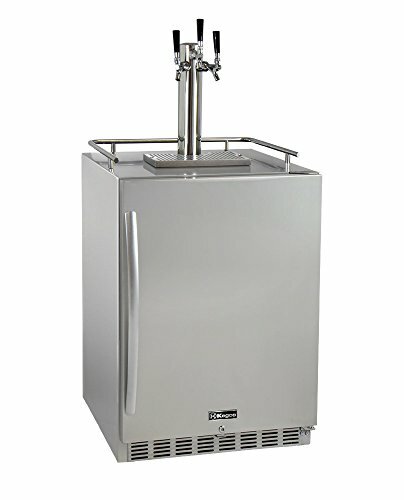 INCLUDES COMPLETE KEG TAPPING KIT: This Kegco beer refrigerator includes all of the draft beer dispense equipment you'll need to pour a cold, tasty glass of beer. The dispense kit comes complete with a brand new 5 lb. aluminum CO2 tank, a single gauge CO2 regulator, 5 feet of 5/16 inch I.D. blue air line assembly with 2 snap clamps, D system keg couplers, and a 3" diameter chrome plated metal double faucet draft tower. The CO2 tank ships empty and will need to be filled locally. LARGE INTERIOR: This beer refrigerator features a spacious interior that is large enough to easily hold any full size keg, including Miller kegs, Coors kegs, and rubber kegs. It can also hold up to two 5 gallon D system kegs or up to three 5 gallon Cornelius ball lock home brew kegs, which gives you the option to dispense more than one beer at a time. When you're not using this unit as a keg cooler, it can be easily converted into a regular all-refrigerator for additional storage. CONVENIENT DESIGN FEATURES: This keg refrigerator has all of the same great features that you've come to appreciate in other Kegco models, like attractive styling, an easy-to-clean removable built-in drip tray, a chrome guardrail that helps prevent glasses from sliding off of the countertop, and easy rolling casters that allow you to easily move the unit from the kitchen to the patio for your backyard barbecue! These kegerators lock to keep the unit from moving again once it's in position. COMMERCIAL GRADE DUAL GAUGE REGULATOR: This NSF approved Kegco 762 Commercial Grade Dual Gauge Regulator has been specially designed to deliver reliable peak performance even in demanding commercial environments, and has been durably constructed for a consistent flow pour after pour. It features a T-Style adjustment valve that makes it easy to adjust the pressure in the keg, and dual gauges indicate both how much CO2 pressure is inside of the keg and how much CO2 gas is left in the cylinder. LEVER HANDLE KEG COUPLER: This NSF-approved Kegco KT85D-L "D" System Keg Coupler features a sturdy nickel-plated forged brass body with a stainless steel probe, and is designed for use with all domestic brand American D system Sankey kegs. The lever-handle design is easy to use - simply pull out and then down on the handle to couple the keg. A 55-psi pressure relief valve makes this coupler even more convenient to use, allowing over-pressurized gas to escape before it enters your keg. 12" SURFACE MOUNT STAINLESS STEEL DRIP TRAY: Designed with style and convenience in mind, this drip tray is constructed from 100% stainless steel and has an attractive brushed finish that will look great on any kegerator. It is dishwasher safe and features a detachable grill for easy cleaning. Because it does not come with a drain, this drip tray is perfect for use where running a drain would be difficult. DELUXE CLEANING KIT: Our deluxe hand pump pressurized cleaning kit is a must-have to easily and effectively clean your beer lines - without the hassle of removing your faucet! Just unscrew the beer line from the coupler and screw it directly onto this kit. The 1/2 gallon cleaning bottle holds plenty of the included Kegco beer line cleaner, which is nitrate-free, low in phosphates, and 100% biodegradable. A convenient nylon brush is also included to allow you to easily clean your beer faucet. 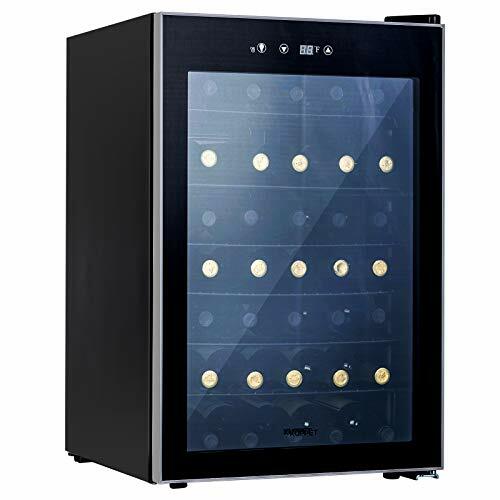 【PERFECT WINE STORAGE】With its 35 bottle storage capacity, this wine cooler unit is perfect for chilling and storing red，white wine or other wines (such as Beer and Champagne). 【PRODUCT FEATURES】 Saving space design with exterior digital Touch controls and LCD temp (°F/°C);Product Size:20.31"(D)x 21.65"(W)x 32.28(H)";Net Weight: 70.55lbs. 【COMPRESSOR REFRIGERATION】Use environmentally friendly compressor refrigeration , faster than traditional thermoelectric cooling, wider range, longer use time, integrated LED lights and built-in circulation fan and ventilation grill. 【EXCELLENT STABLE TEMPERATURE】 The KUPPET cooler enables you to store your wines short & long term in a consistent stable temp environment, and allows you to customize the temp to one that creates an ideal climate for your wines ageing process Range 37.4º - 50ºF (3º - 10ºC). 【SUPER QUIET & GOOD SEALING】Operating sound less than 35dB, it does not affect family rest even if placed in the bedroom;Our wine cabinet with double-layered glass,so it can avoid light and heat, better maintain the freshness of wine!